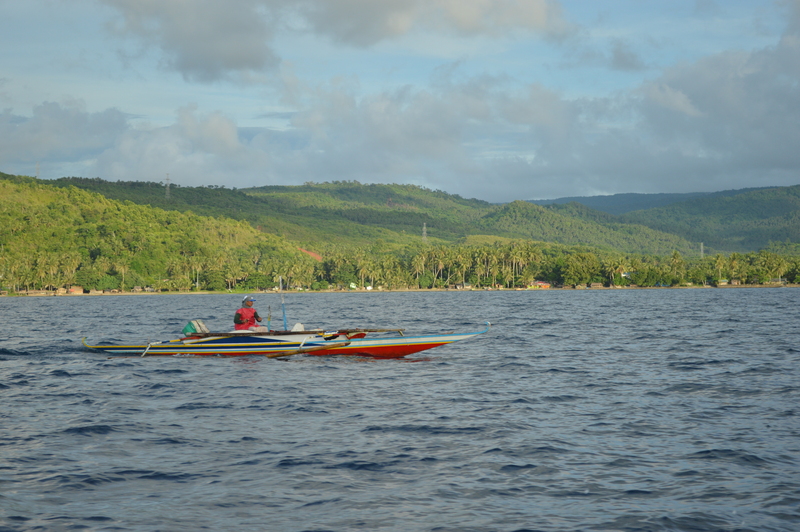 It takes a two to three-hour boat ride before reaching the Dumagat community in Brgy. Cagsiay 3, Mauban, Quezon Province. Being settled in a far-flung barangay for so long, the Dumagat tribe senses fear and hesitation whenever people visit their community. Through the years, however, they have been trying to overcome the anxiety of meeting new people by casting big smiles and extending their hands for a warm welcome. The Dumagat is an indigenous people (IP) group residing in the mountains of Brgy. Cagsiay 3, the northernmost barangay of Mauban town in Quezon Province. Their community can be reached through a two to three-hour boat ride from the town proper. During stormy seasons, the community can only be reached by foot through a day of walking along a treacherous trail. With such distant location, the Dumagat got used to living within their own tribe, thus being timid when meeting non-IP residents whom they call the Katagalugans. Through several years of keeping their tribe isolated, they have learned that opening their community will not only bring them closer to the Katagalugans but will also welcome a lot of change in their tribe. In their remote community, the construction of a tribal hall is a visible sign of acceptance and change within the Dumagat tribe. The residents are able to participate in the construction of a tribal hall project in February 2016 through the Kapit Bisig Laban sa Kahirapan-Comprehensive and Integrated Delivery of Social Services (Kalahi-CIDSS) program of the Department of Social Welfare and Development (DSWD). “Mahirap sa pakiramdam namin pero sinusubukan naming makilahok dahil para naman sa ikabubuti ng aming pamayanan ang hatid nila. Unti-unti, natututo rin kaming makihalubilo sa iba. (We have hesitations, but we are trying our best to participate since the projects they bring are for our community. Little by little, we are starting to learn to deal with other people),” said Rosalinda Del Mundo, 63, the Kaksaan or chieftain of the Dumagat tribe. According to Rosalinda, this tribal hall symbolizes the welcoming of new opportunities for their tribe. This will be the center of all activities and projects towards the development of their community. In Kalahi-CIDSS, the whole Dumagat community is engaged in the decision-making, planning and implementation of the tribal hall. They were trained on proposal development, financial management, and construction estimates to be equipped with skills in managing the project. They chose to implement a tribal hall because they do not have a permanent place for their gatherings and meetings. The Dumagat tribe now has a permanent place to hold their meetings, which are mostly about the activities and projects they engage into for the improvement of their families and community as a whole. “Hindi namin maintindihan ang proseso noong una. Hindi naman kasi mataas ang aming pinag-aralan. Pero matiyaga naman kaming tinuruan ng mga staff ng Kalahi hanggang sa kayanin naming gawin ang mga ito. (We had a hard time understanding the process because most of us did not finish school. But the Kalahi-CIDSS staff were very patient to us and guided us until we finish the tasks),” shared Rosalinda. Another challenge for them was the canvassing of materials in different stores in the town proper where they had to talk and negotiate to several people. The canvassing of materials is a requirement in the Kalahi-CIDSS process to ensure that the project fund is maximized without compromising the quality of the materials being used. Leonel Luna, 18, assigned with the task, shared that he was so shy dealing with the Katagalugans because of fear of being teased or misunderstood. But he realized that they were actually friendly and there’s no need to be scared at all. “Masaya rin kasi marami akong natutunan sa pagka-canvass at marami akong nakilalang mga tao. Hindi ko akalain na nakayanan kong gawin ‘yun. (I’m happy because I learned a lot from canvassing materials for our tribal hall. I got to know a lot of people. I can’t even believe that I was able to do it),” said Leonel wearing a proud smile. Leonel also added that transporting the materials to their barangay was a struggle as they had to deal with the big waves during rainy season. Leonel marked it as an unforgettable yet worthy experience for the sake of their tribe. As of August 2016, they are halfway from finishing the construction of their tribal hall. The PhP486,900 project will serve the 108 Dumagat households in Brgy. Cagsiay 3. As Rosalinda puts it, the tribal hall is a home of opportunities. During the construction of the project, some of them were hired as laborers where they earned around PhP250 to PhP350 a day. Jose Borrommeo, 30, shared that this was a good opportunity to earn for their family even for a short period of time. “Malaking tulong sa amin ‘yun dahil wala naman kaming kinikita dito mismo sa amin. Naipambili ng ilang kagamitan sa bahay ang kinita namin sa pagko-construction. (It’s a big help since we do not have any source of income here. We were able to buy stuff for our home with the money we earned from the construction),” Jose shared. Last July 2016, they used the tribal hall as a venue for doing and storing crafts as part of the livelihood project offered by the municipal government of Mauban. They made Christmas trees from coconut husks, which will be sold in the town’s tourism center. The tribal hall, made of concrete walls and galvanized iron roof, is strong enough to withstand strong winds and rains. This can serve as their evacuation center in times of disasters. Further, Rosalinda sees the tribal hall as a place for refuge. Since the tribal hall is concrete and a lot sturdier than their houses made of nipa and cogon, it can serve as an evacuation area in times of disasters. But above all, Rosalinda reiterated that their tribal hall is a sign of their being open to new opportunities and building ties with other people. “Paraan din ito para maipakita namin na hindi kami tamad at may ginagawa kami para umunlad ang aming buhay. Iyon ang ganti namin para sa mga taong tumutulong sa amin. (This is also our way of showing that we’re not lazy and we’re doing something to improve our lives. This is how we give back to the people helping our tribe. ),” said Rosalinda with a big smile.